The Western genre is extremely popular and has many fans throughout the world. So when you design a game like De Gunslinger: Reloaded, you have to stick to the rules of the genre. That’s precisely what Play ‘N Go has done in their latest release; you can almost taste the whiskey in the saloon, that good. With notorious outlaws like Jessie Picket, Butch Curry and Wild Bill in the lead, the Gunslinger: Reloaded video slot has become a game that lives up to promise of the genre. During one of the bonus rounds, you even get the chance to go after the outlawed criminals. Software provider Play ‘N Go previously released a version of Gunslinger. However, the developers revamped this reloaded version with better features. You can win up to 5,000 x your total bet. This game can turn you into a rich cowboy with a big saddlebag of money. Prepare yourself for the bullets that will whizz past your ears and revolvers that you will have to handle yourself. 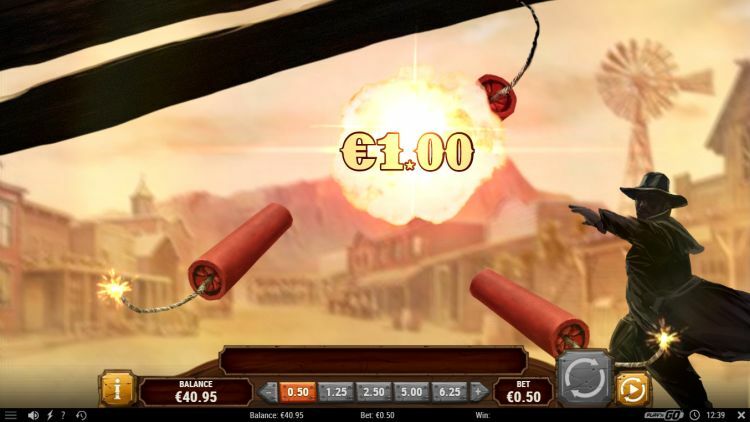 Step into the Wild West of the Gunslinger: Reloaded video slot. How does the Gunslinger Reloaded video slot work? You play this video slot on 5 reels with 3 rows of symbols, all related to the Wild West theme. The game has a total of 25 pay lines and a minimum bet of $€ 0.25 per spin. The maximum bet costs you $€ 100 per spin. 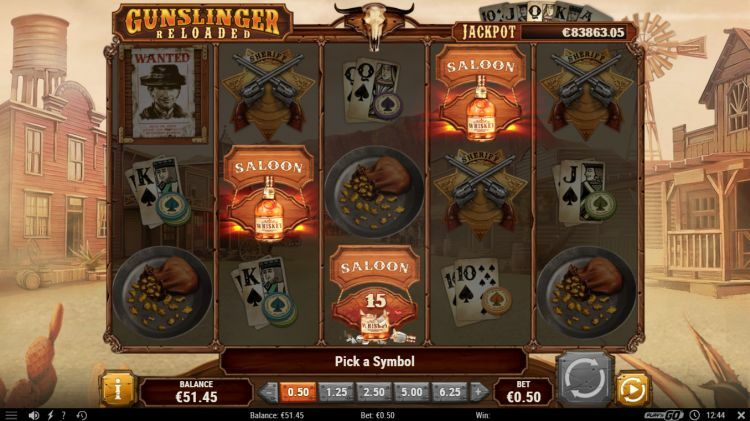 That makes the Gunslinger: Reloaded video slot suitable for every type of player. Especially the progressive jackpot is attractive for players with a larger budget. The Shoots the Cards Feature offers you the chance to win this progressive jackpot. More on that later. The theoretical payout rate of 96.31% is excellent for an online casino game. 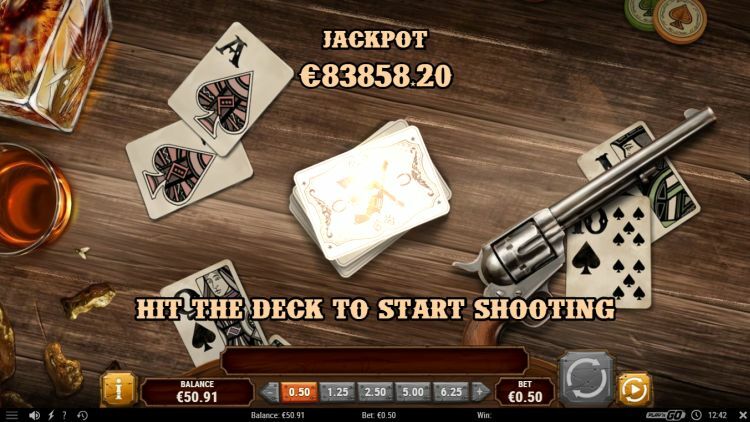 We estimate the variance of the Gunslinger: Reloaded video slot to be medium. Software provider Play ‘N Go slightly polished up the symbols, but they are the same as the ones used in the previous version of the Gunslinger video slot. The bag with the gold coins is still one of the best paying symbols in the primary game. Additionally, they have added a gold pan to it. A 5-of-a-kind of this high win symbol awards you 40 x the total bet. The saloon girl symbol also received a small makeover. This time the symbol consists of a pendant and a somewhat more plump salon lady than before. 5-of-a-kind of this symbol yields you 20 x your bet. The guns and the sheriff badge are worth 12 x your total stake for a 5-of-a-kind. Furthermore, this game still has the regular card symbols consisting of 10, J, Q, K and A: these get you up to 6 x your total bet. The Wild symbol consists of a bounty hunter and replaces all other symbols except for the bonus symbol, free spin symbol and scatter symbol. Spin 5 wilds for the payout of the astronomical amount of 400 x your total bet. That is serious money. The scatter symbol of this game consists of the white horse. However, this scatter symbol keeps it simple, it does not activate a bonus feature or anything like that. You just win a nice price of 150 x your total bet for a 5-of-a-kind. A minimum of three whiskey bottles on the middle reels, activate the Bottle Spins Free Spins Feature. This is the moment that you can finally step into the boots of a cowboy and shoot one of the three bottles. When you hit the bottle, you see how many free spins you get, and the bonus game starts. During the bonus game, your winnings are doubled. The Bottle Spins Free Spins can be activated again during the bonus game, creating an awesome opportunity for you to make some proper cash. 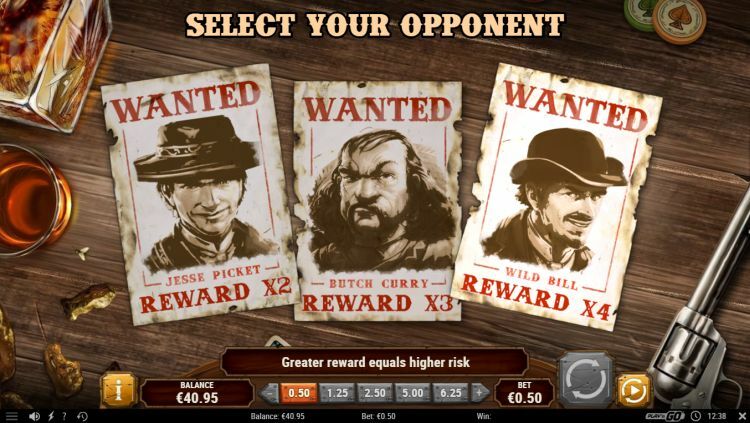 Three “wanted” posters of the notorious outlaws Jessie Picket, Butch Curry and Wild Bill on reels 1, 2 and 3, activate the Bounty Hunt Feature. You then get to choose which outlaw of your choice; you want to hunt down. You have the opportunity to shoot bottles, throw knives and have sticks of dynamite explode before you face off with the chosen outlaw. The multiplier is applied to all winnings that are made during the Bounty Hunt Feature. This way you can win up to 72 x your bet for bringing in Jessie Picket, up to 216 x your total bet for Butch Curry and the grand total of up to 960 x your total bet for Wild Bill! The progressive jackpot can be won during the Shoot the Cards Feature. If you manage to make a winning combination with all playing cards, you activate the Shoot the Cards Feature. The higher your bet is, the greater the chance that you will win the jackpot. You win the progressive jackpot if all cards contain a sheriff star. At the top right you can keep an eye on the current status of the progressive jackpot. Was a renovation of the previous version of the Gunslinger much needed? No. Are we happy with this new version of the Gunslinger? Yes! 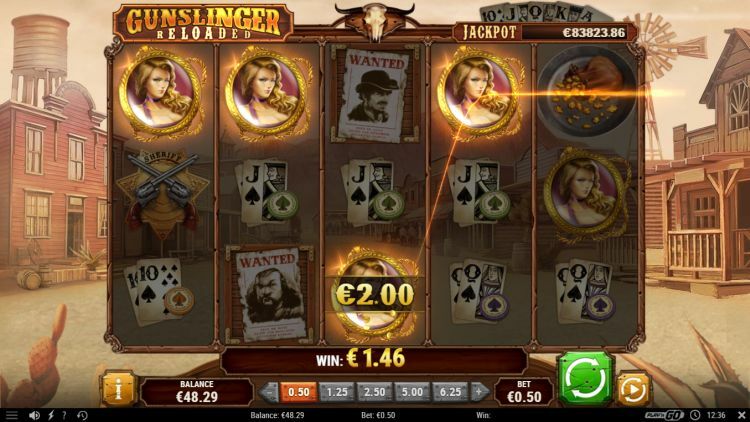 The Gunslinger: Reloaded video slot is a high-quality slot game that contains all essential factors. The animations and graphics look good, the game has exciting moments, and you can win some decent amounts of money. Software provider Play ‘N Go already has an excellent reputation for delivering exceptional slot games. Where can you find Gunslinger Reloaded? 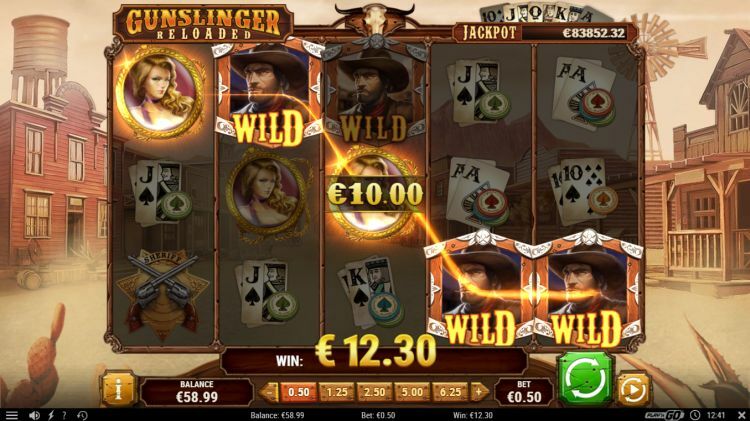 The Gunslinger Reloaded slot is found at all reliable Play ‘N Go casinos. One of these Play ‘N Go casinos is Casumo, which is one of our favourite online casinos. 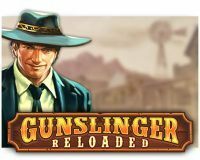 You can play the Gunslinger Reloaded slot at Casumo with a 200% bonus up to $€50 plus 200 free spins.